This sandwich came about one day at noon, when I was deciding whether to have breakfast or lunch; I ended up taking a grilled cheese to the next level. Start off by rendering two nice, thick slices of applewood-smoked bacon, diced small, in a heavy skillet over medium heat. Crack some fresh black pepper over the bacon, and while it’s cooking, whisk three large eggs with a tablespoon of sour cream and a quarter cup of water. Whole-wheat bread or grain bread works nicely for this — lay out four slices and top each with sliced cheddar. When the bacon is just about done, strain out the fat (saving it) and add the eggs to the pan with the bacon. Let them almost set before lightly scrambling them with a wooden spoon. When the eggs are about done, divide them onto two slices of the bread. 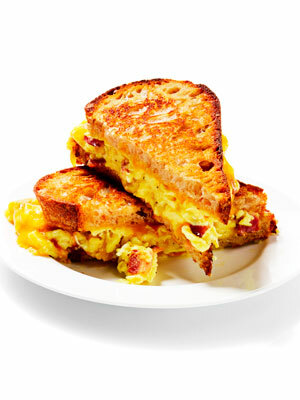 Sprinkle sea salt on the eggs and then cover them with the other two slices of bread and cheese. After wiping out the pan with a dry cloth, add some of the bacon fat and a tablespoon of butter to the pan over low heat and place the two sandwiches in the pan. Cover and let them cook for about four minutes, until they are golden brown, then flip them over for another four minutes. When the cheese is melted, they’re done. Only one pan from start to finish. Makes two sandwiches.